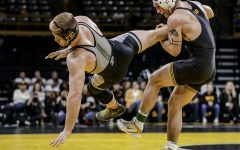 The Hawkeye men finished their first home meet with a solid performance, while the women fell in heartbreaking fashion. 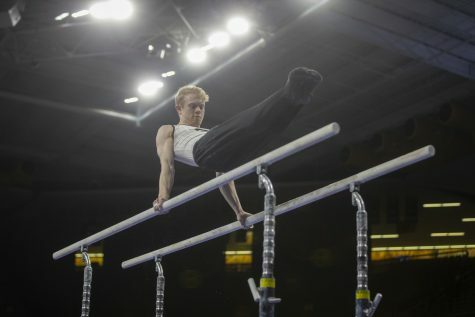 Iowa gymnast Rogelio Vazquez performs on the parallel bars during a gymnastics meet against Minnesota and Illinois-Chicago on Saturday, Feb 2, 2019. The Golden Gophers won the meet with a total score of 406.400 with the Hawkeyes scoring 401.600 and the Flames scoring 355.750. 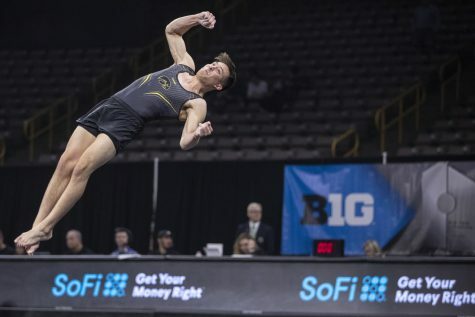 The ninth-ranked Iowa men’s gymnastics team finished second in its home-opener against No. 6 Minnesota and Illinois-Chicago on Feb. 2, and the Hawkeye women fell just short of Ohio State on the road, 195.000-194.775. It was an exciting meet for the Hawkeye men. The team not only competed hard in front of a home crowd, the atmosphere for the team was incredible. Reive and the Hawkeyes were also proud because the team accomplished one of its biggest goals — the team set a season-high team score, breaking 400 points for the first time this season. 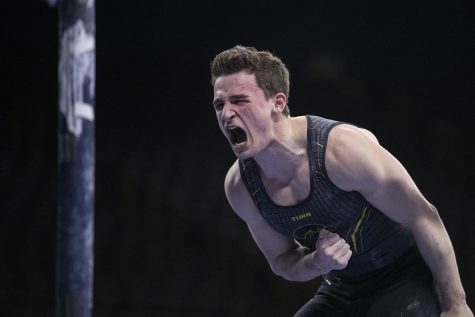 Iowa had three of the top four finishers in the all-around competition, with many more Hawkeyes tallying season bests. 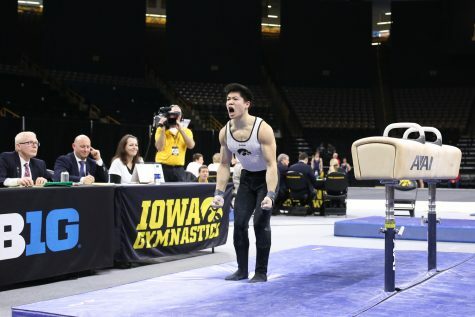 Sophomore Bennet Huang stood out for the Hawkeyes in every event. 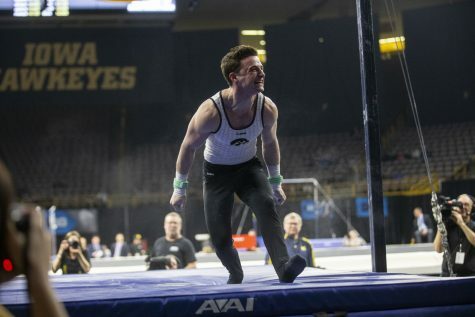 He finished in second just behind the 2018 NCAA runner-up Shane Wiskus of Minnesota with a season-best of 80.250. Judges watch Iowa gymnast Bennet Huang perform on the floor during a gymnastics meet against Minnesota and Illinois-Chicago on Feb 2. In the end, Huang credited his final score not only to hard work and dedication but to his coach. “Today, Coach told me before the meet to do my job, and I think we have a mutual trust in each other, where I trust the training plan, and he trusts me to deliver the job,” Huang said. Following Huang was junior Andrew Herrador and senior Jake Brodarzon at third and fourth with 78.050 and 76.600, respectively. This was a special meet for Brodarzon — it was his last opening home meet. The Hawkeyes started the meet on floor, in which they jumped out to a 66.900 lead. Huang led Iowa in the event with 13.950 points, placing third. Sophomore Kulani Taylor (13.150), Brodarzon (13.500), and Herrador (13.400) all recorded season-bests on floor. 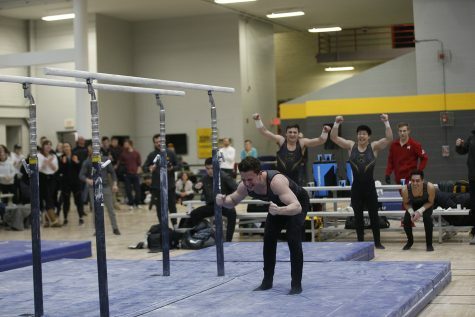 On pommel horse, Huang tied his season-best (13.500) for second place, and freshman Evan Davis tallied a season best 12.900, which landed him fifth place. The third rotation took the Hawkeyes to the rings, where Brodarzon led the Hawkeyes (13.650) to earn second behind Minnesota’s Wiskus. 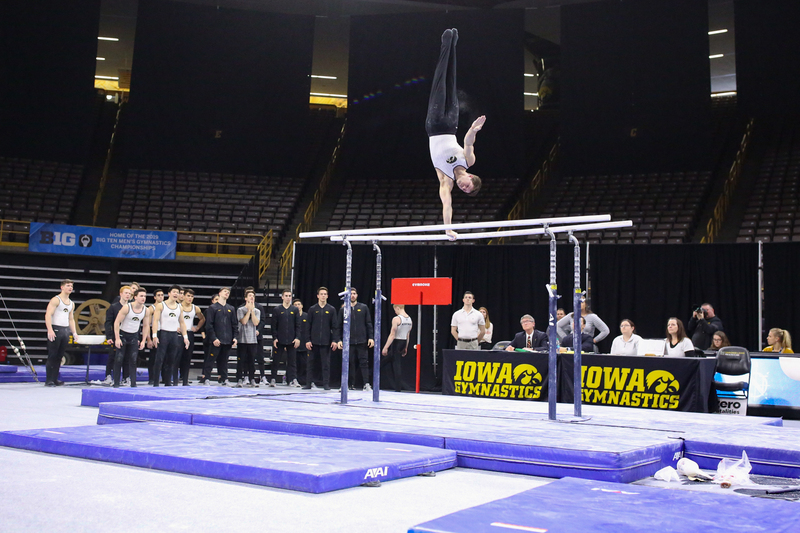 Iowa regained the lead on parallel bars after the team scored a 67.350. Freshman Stewart Brown placed third overall in the event with a season best (13.900). 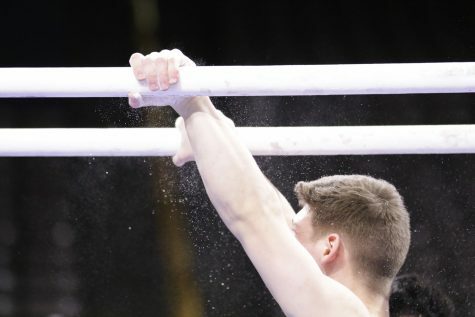 Stewart Brown rubs down the parallel bars with chalk during the gymnastics meet against Minnesota and Illinois-Chicago on Feb. 2 in Carver-Hawkeye. 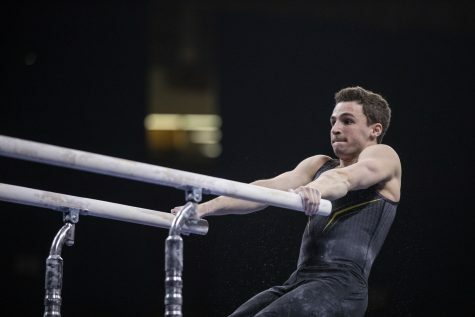 Brown put the needs of his team first, and that really showed on parallel bars. Iowa finished with the high bar, on which senior Rogelio Vazquez placed second (13.500) with Herrador was right behind him in third (13.300). 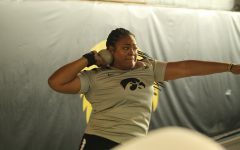 Though the Hawkeyes did not come out on top in the final team score on the women’s side, the GymHawks recorded plenty of high marks. On vault, the GymHawks tallied a new season-high (48.625) and on the floor (49.125). The GymHawks started the meet on bars with senior Nicole Chow leading off. She hit (9.850) to pump up the squad. Sophomore Maddie Kampschroeder followed (9.800) with junior Clair Kaji right behind (9.750). Two freshmen then took charge on vault. Bridget Killian nearly had a perfect score (9.800), and Lauren Guerin came in close behind (9.725). This is the second week in a row that Killian and Guerin have had success. Killian took care of business on vault on Jan. 26, placing first (9.750) against Rutgers. Guerin changed things this week and showed that she can shine on more than one event after winning first place on floor against Rutgers. To top it all off, both Killian and Guerin also recorded new career-highs with these impressive vault scores. Next up were junior Charlotte Sullivan (9.725)and senior Misty-Jade Carlson (9.775), who both recorded season-bests. At that point in the meet, it looked like the GymHawks were quickly narrowing the Buckeyes’ lead, 98.100-97.000. 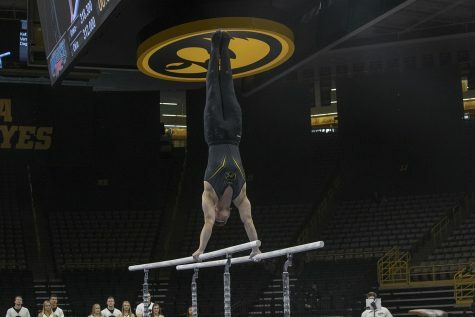 The third rotation was on floor, and the GymHawks took the lead. Killian (9.875) and freshman Allie Gilchrist (9.750) both stood out, and Sullivan (9.775) and Kaji (9.875) both notched season-bests. In the final rotation on beam, the outcome looked good for the GymHawks. Carlson took first on beam (career-high 9.850), contributing to a crucial Hawkeye lead. Kaji ended with a 9.800, and Killian contributed a 9.725. 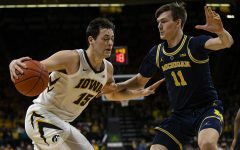 Though the GymHawks finished strong, the comeback was not enough to gain the win — just over 0.7 separated them from the Buckeyes.